Kathmandu Tilganga - Shanti Leprahilfe Dortmund e.V. The new buildings of the Hape Kerkeling Clinic – an impressive round building where the new solar panels were installed on the rooftop. With these photovoltaic modules, the clinic is independent from the constant power cuts in the city. 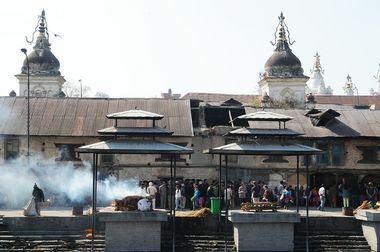 The Pashupatinath Temple, located in the neighbourhood a short distance from the Shanti station, is one of the most sacred places for devout Hindus. 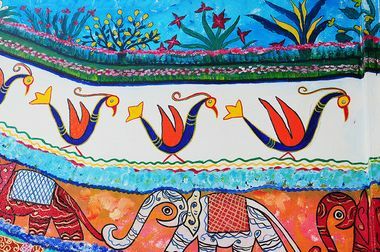 Many of the station's walls are already adorned with colourful Maitili painting. 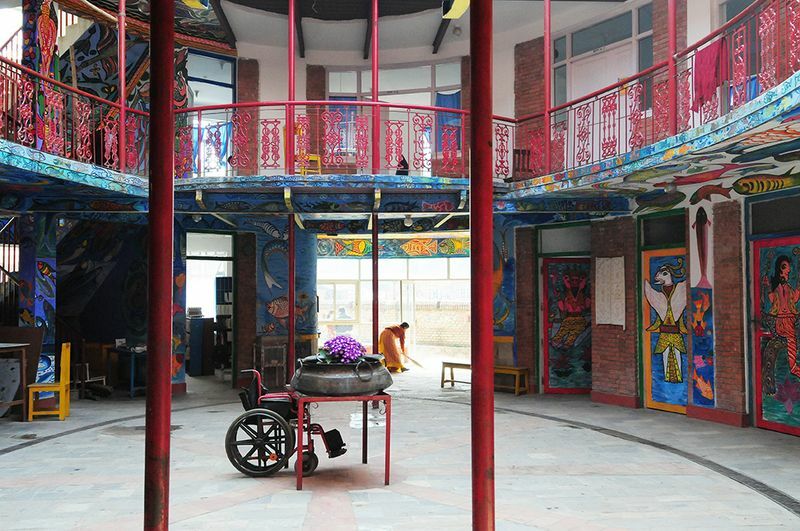 The courtyard of the Hape Kerkeling Clinic in Kathmandu-Tilganga. The stairwell painted in Maitili style by Shanti residents suffering from leprosy. 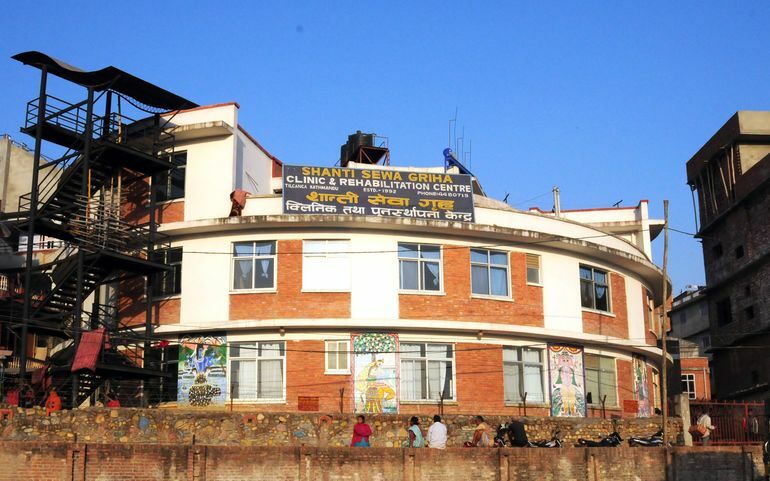 Shanti's largest facility is in the Tilganga district of Kathmandu, directly on the holy Bagmati river, which flows into the Ganges. In the direct vicinity, tradition and the modern world and closely intertwined. one of the largest sacred places on earth for Hindus, the Pashupatinath Temple, and the international airport. The property on which the new Shanti centre was opened in March 2009, was purchased with the help of a donation from Hape Kerkeling, who won 500,000 euros for Shanti on a celebrity special of the game show “Wer wird Millionär” ("Who's the Next Millionaire?"). Since then, the Shanti clinic in Tilganga has borne his name. The buildings in Tilganga were constructed with assistance from the German Federal Ministry for Economic Cooperation. Besides the clinic, the complex also includes an outpatient clinic and pharmacy, as well as a hospice facility, kindergarten and rooms for the residents of Shanti in need of help. They have various forms of employment, making a significant contribution to the everyday life of the Shanti community. For example, the vegetables grown through organic-dynamic cultivation make around 1,200 meals for the hungry each day, and the fountain in the courtyard provides clean drinking water, even for the neighbours in the surrounding slums. A donation from the Else Kröner Fresenius Foundation made it possible to add a photovoltaic system on the clinic's rooftop, making Shanti at least partially independent from the constant power cuts in the city. Thanks to these solar panels, residents have a constant supply of electricity for lighting and hot water. 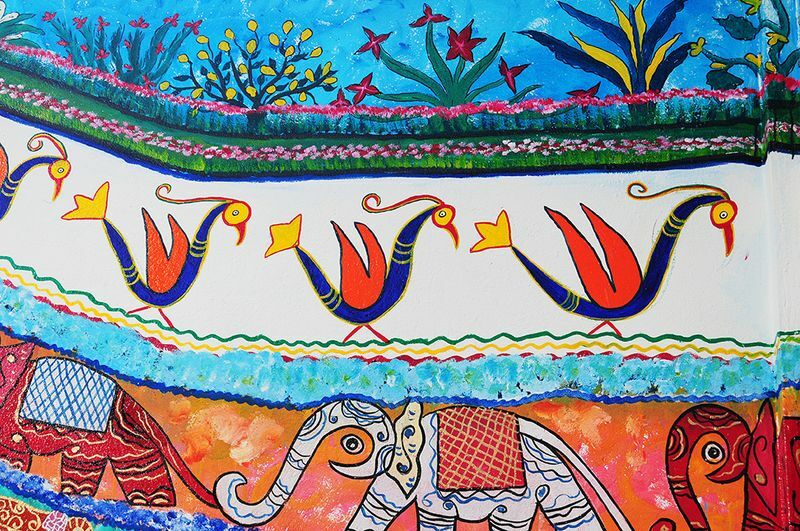 The spirit of recycling is adhered to at Shanti, allowing for fantastic creations. For example, inner tubes from old tyres make practical, durable bags. Plastic bottles from hotel garbage are filled with sand and covered with clay – they stabilise the walls of the greenhouses without having to purchase bricks. Old bed linens donated from Europe are sewn by skilled hands into clothing for the children and infirm. 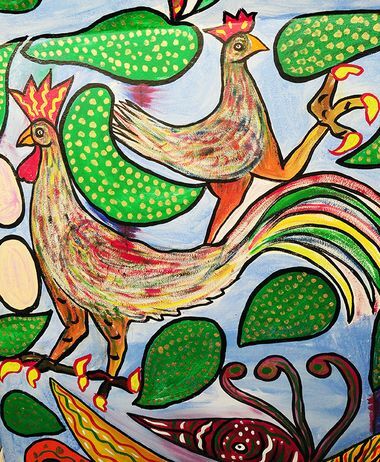 The walls of the clinic and other buildings are decorated with colourful Maitili paintings. In this way, Shanti plays an important role in preserving this ancient cultural tradition.